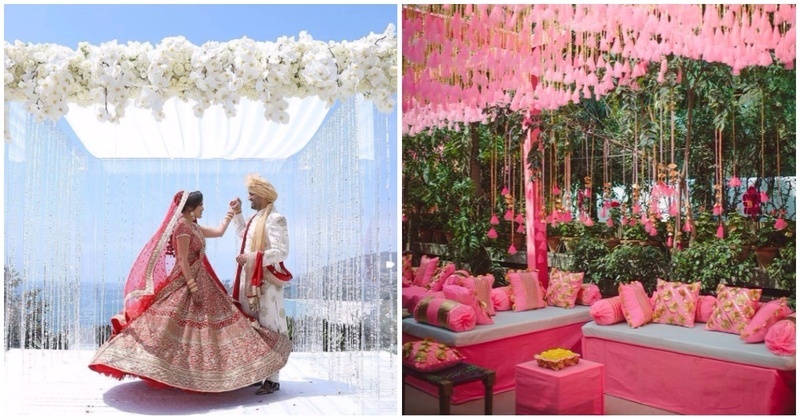 While gendha-phool is ever-present at any Indian wedding, we found some wedding decor ideas that are unique and simply stunning! This gorgeous mandap overflowing with pink flowers and set on water! These overhead lights in cages, surrounded by red flowers add an elegant vibe to the ambience. We know this umbrella isn’t functional but it sure looks hella cute. A mandap that isn’t overdone but minimalistically stunning. Use creative slogans and personalise them in fun, quirky ways! Another beautiful mandap with an all-white theme and crystal strings. Larger-than-life peonies as a wedding installation! We’re used to dreamcatchers over our beds but these cute, colourful ones are a refreshing change! Pink tassels work brilliantly as well. This all-pink decor is a treat to the eye! Fairy-tale worthy wedding decor for a reception! Okay, maybe this is way too much pink for a wedding. But don’t you think it’s perfect for a bridal shower? Floral photobooth idea?! Love the crescent shape and seating detail. Check out more awesome photobooth ideas here!